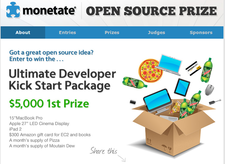 According to Monetate, any project producing source code under an Open Source Initiative approved license is eligible to participate; however, the competition is only open to developers who live or work within 60 miles of Philadelphia, Pennsylvania. "The Ultimate Developer Kick Start Package” valued at $5,000 will be awarded to the winning entry and includes a MacBook Pro, an Apple 27 inch LED Cinema Display, an iPad 2, a $300 Amazon gift card good for EC2 and books, plus a month’s supply of pizza and Mountain Dew. All submissions must be received by May 11, 2011 no later than 11:59 PM EST. The French international competition Trophees du Libre is again offering cash prizes for the most innovative open source solution for 2009, and the smaller the project, the better the chances of winning.